Welcome, welcome to the Project Log of Rollin All Ones Studios! 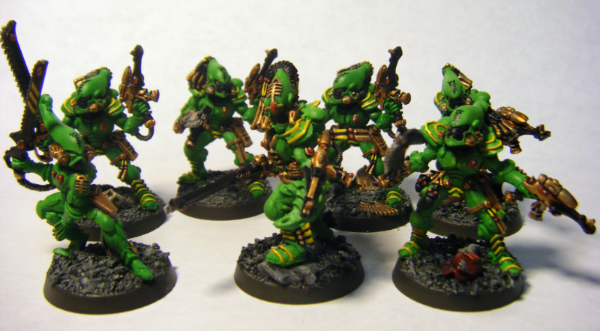 First started as a log of my personal Ork army, this blog has since expanded to cover my commission work as well! So far I have painted models from Infinity and Warhammer/40k, and even a few limited edition models from Kabuki Miniatures. I'm always willing to take on small projects here and there, so if you have any questions about models you want painted, definitely drop me a line! For ease of reference, Ill be providing links to places in the blog of particular interest, much like Gitsplitta's excellent Mantis Warrior blog. Click HERE to jump to the Catch-Up Week!! Click HERE to jump to the Fire Hawk Painting Tutorial!! Click HERE to jump to my commission work!! Click HERE to jump to the beginning of the Red Scorpions commission!! Click HERE to jump to the beginning of the Marines Errant army. 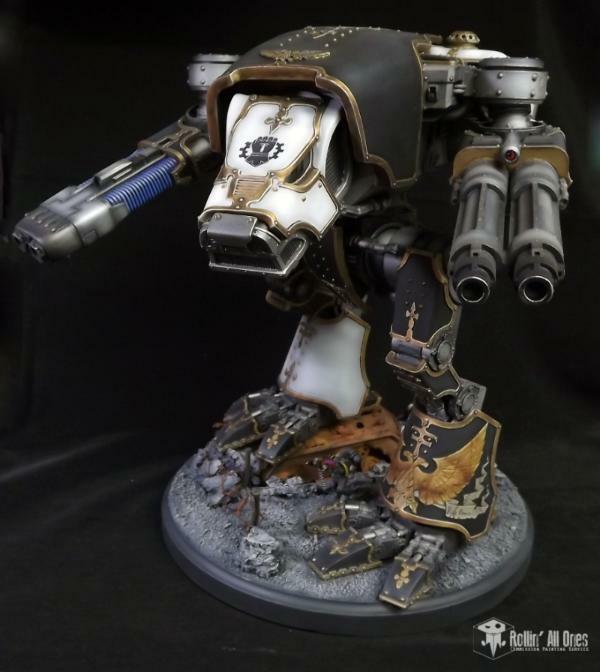 Click HERE to jump to my work on a Warhound Titan. Click HERE to jump to the Storm Dragons- my Loyalist Counts-as "Heldrakes"
Actually came up with it a few years back as a character in stories I used to write. Since then its become my online pseudonym. I randomly punched buttons when I was making the name, but it actually turns out that Asura are Hindi Demons. Ramos Asura wrote: Actually came up with it a few years back as a character in stories I used to write. Since then its become my online pseudonym. I took templeork's suggestion on using Vermin Brown, and I gotta say, it looks AWESOME! A very orangey brown on a gray blue. pops very nicely. I need to get a different color for belts (as too many VB straps would look a bit too bright) but the VB adds a great bit of contrast! Bah! I gotta get a better lighting setup around here. In the mean time, here's a Rokkit and Big Shoota Boy for your viewing pleasure. In other news, i have a AoBR Deffkopta Im converting so as to get different looks on the battlefield. 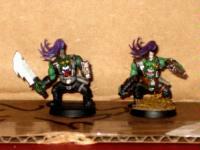 Also on the table are a bunch of Boyz and Kaptin Badrukk! Im hoping to make Flash Gitz as soon as I can get a box of nobs. Some great painting here! Especially the Big Mek! This is insanity at it's finest. The Big Mek's currently my favorite model. not only do I like having the KFF around, but it acted perfect with the lenses! Well... I guess you can get the gist of my dilemma anyways. It just doesn't have the punch I want. Needs Moar Dakka! Originally I was gonna paint Evil Sunz or Bad Moonz, because I liked the impact of the bright flashy color. But I want to use a different color scheme. One that is unique to me, yet still has that punch. For the life of me I cant think of anything... Im gonna finish this group as they are (least they're the AoBR Boyz and not my nice shiny set. I mean, my space marines were easy! One inside joke with friends got me the "Shelled Ones". In the mean time, i re-painted the Space marine Captain's power sword like a blog I was reading the other day. I liked how it turned out... though Im still working on making a smooth gradient on surfaces. Thanks Death Gear. I appreciate the encouragement. Ever since I joined Dakka Ive gotten more painted up than usual. Probably a good thing, eh? I must have ADD or something. Instead of thinking of a color scheme for my orks, I've been contemplating making a Warhound Titan for my Space Marines. At this point its nothing more than a thought, but I was pondering putting a big ol' turtle shell on the back of the titan (or something of the sort) Making it in essence a giant fighting tortoise. Eventually I should work on a little fluff for them, but for now they are a source of entertainment, as well as an interesting addition to the field, as far as color goes. As always, I encourage C&C (even on these half-baked, mountain dew-induced schemes). I thought 'Orange' for a moment, but its not very Orky >< Power Armor is waaaay easier to get painted. Ketara wrote: To survive on the net requires that you adapt the attributes of a Rhinocerous to a certain extent. A thick skin, a big horn to stab people you don't like, and poor eyesight when certain images are linked from places like 4chan. It looks to fit the bill of what I'm looking for, and I found plenty of reference pics! What do ya think... Warhound class size? I have Orc Boyz, fully painted and ready to OWN! Finished most of the highlighting on my current squad of boyz, leaving only the flesh and gun bitz to do before its done! In the mean time, I've been working on bases for the next group of boyz. It was pretty easy. i figure Im gonna do something similar for the whole army. Most arent finished quite yet. I love your turtle marines , the color scheme is surprisingly nice to look at. the white turtle icon is CUTE . *edit oh god i cant type proper sentence today. i like the blue suit on the orks.. it would be nice to see a urban camo scheme with them.. i think it would fit very well with the way the suit is.. btw great painting..
LunaHound wrote: I love your turtle marines , the color scheme is surprisingly nice to look at. I really love how it turned out. I was wanting something unique and brand new, and I dont think ive ever seen pumpkin-orange Marines yet! Long story short- I pretty much made a 'religion' that worshiped 'Wstfgl the Random Turtle God'. Im considering building a titan to suit them as well. Oho! And now a Terminator! Only thing i dont really have is a name for the Chapter. Ive just taken to calling them "The Shelled Ones" (heh... sounds a little bit chaos-ey). Thanks a bunch you guys! Anywho, great news (or it was for me at least): Im finally moved into my apartment! Bear with me now, Im trying to figure out the best way to take my pictures, so lighting is iffy on a couple of these. Firstly, I finished my second squad of Boyz, painted with the Shadow Grey and Vermin Brown as the above one was. Turned out better than I thought. Giving considerations to my next batch. Then with the good lighting I had, I took pictures of the Nobz. This guy's gotta be my favorite Nob at the moment. Sure its a stock AoBR Nob, but I love the eyepatch! More shots of the Boyz. Couldn't post them yesterday because of the glitchy net around here. C&C welcome and appreciated, as always. Havent gotten around to basing, but they'll be done soon! Love how your orks are coming along. Keep up the good work. Btw I took your the orbs off your big mek and placed them on mine TY for the great idea. Maybe I can return the favor with your AOBR orks. What I did with mine read from another Tutorial is to cut off specific parts of the arms and wrists / weapons to create unique looking orks Like these. Perhaps a lil flavor more to your nicely painted orks. I like the marines nice color scheme . Im definitely gonna do something like that then. I like the idea! Just gotta get a razor saw- Im a little nervous about hacking away at my boyz with a big knife. The purple hair is another odd little touch. Its great contrast between the green of the skin! Nice work on the Mek. Im glad you like the idea! I can't remember where I picked up the thought/idea but so far its been one of my favorite techniques! As for cutting them my friend is an exact-o knife or a Gerber Knife if your feeling Rambo like. 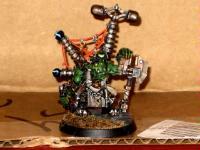 Again, excellent job on your orks I am drawing a lot of inspiration from them. Anyways. Noticed in your thread you're doing a looted Hammerhead. At this point Im busy touching up spots on it and building rokkits to put in the tubes. Hahahah. Man that is amazing work. Completely orkied well. I love the rivets on the plasti card. Btw where is a good place to pick up plastic card? The stacked plates on it look amazing. For plasticard, most hobby stores should carry it. Its commonly used for RC car bodies and model railroading stuff, so places that sell that stuff usually have plasticard. Its also known as Sheet Styrene. I picked mine up at HobbyTown USA, but I think Hobby Lobby might carry it as well. Well I know where a hobbylobby is so that works thanks. I DEMAND AN UPDATE!!! MORE ORKS!!! Now I know what you guys must be thinking. "Where has our favorite person in the whole world gone off to?" "Where is that devilishly handsome Ork Player who seems to spend way too much time on details?" With school approaching (Tuesday of next week) Ive been busy fighting with the miserable idiots in Financial Aid as well as moving down to my new apartment. And of course, wouldn't you know it, but the week after I move in, the router blows. then a few days later, the only other hotspot in range was finally secured (to my dismay). And so I was left to paint the remaining stuff I had laying around. Got all my Boyz done, my army clear-coated, and the Grots started. Alas, I have few pictures. Im still figuring out a place I can take them that gives me the right light. *shrug* Its an ongoing process. However, I did try out a new technique on one of the Grots. So what do we think? Look like wood?